A pair of cufflinks may be a boring gift, however what Dad wouldn't love to receive these stunning cufflinks from a beloved son or daughter. 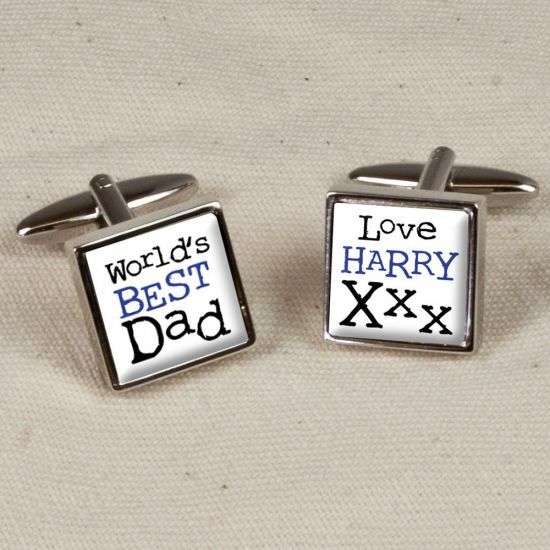 These contemporary square cufflinks are printed with World's Best Dad on one cufflink and personalisation detail on the other. Simply personalise with your name, or the name of your children if it's from them and he will be reminded of the most important people in his life each time he adjusts his cuffs. Much more than mere shirt cuff fasteners, these cufflinks come presented in a smart black cufflinks box. Makes an ideal birthday gift for dad or Father's Day present.